Cauliflower is rich in health benefits. 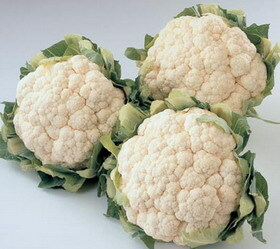 Cauliflower is one of the common types of flowers that used as vegetables. Cauliflower is rich in phytonutrient nutrients such as indole-3-carbinol, sulforaphane, and others that have efficacy in preventing a variety of cancers, such as prostate, ovarian, and cervical. Cauliflower belongs to the family Brassicaceae or cruciferus, this means that the family is still cauliflower with broccoli and cabbage. If we had been familiar white cauliflower, but it also contained a green cauliflower, purple, orange and romanesco. Very low calorie, plus it contains a variety of antioxidants and vitamins, making Cauliflower very beneficial for health. Fresh cauliflower is a source of vitamin C in 100 grams of cauliflower contained 48.2 milligrams of vitamin C. Vitamin C is an antioxidant that has been proven to be able to cope with free radicals, enhance immune function or immune system. Cauliflower contains vitamin B complex group, such as B9, B5, B6, B1, B3 and vitamin K. Those Vitamin is very important in the metabolism of fats, carbohydrates and proteins. Cauliflower is also rich in minerals, such as manganese, copper, iron, calcium and potassium. Manganese in the body is used as a cofactor for antioxidant enzymes in the body, superoxide dismutase. While potassium is an electrolyte in the cell yag very important in countering the effects of sodium which increases blood pressure. Cauliflower contains several phytonutrients, which are efficacious as anticancer, such as sulforaphane and indole-3-carbinol which belong to the class of sterol compounds found in plants. Cauliflower contains sulforaphane and indole-3-carbinol. Indole-3-carbinol is known to have efficacy as an anti-estrogen. Together with sulforaphane, indole-3-carbinol has been shown to prevent prostate cancer, breast cancer, cervical cancer, colon cancer, ovarian cancer by inhibiting the growth of cancer cells, and may provide a toxic effect on cancer cells. Cauliflower is a great source of dietary fiber, which is essential for optimal digestion. When you get enough fiber in your diet, it helps to keep things moving smoothly through the intestines. Cauliflower also contains a compound called glucoraphin, which protects your stomach and intestines from certain health conditions such as cancer and ulcers. Cauliflower contains a high amount of antioxidants, which are essential for the body's overall health and help to prevent heart disease, cancer, and stroke. Antioxidants are also essential in destroying free radicals that accelerate the signs of aging. Because of the omega-3 fatty acids and vitamin K in cauliflower, it helps to prevent chronic inflammation that leads to conditions such as arthritis, chronic pain, and certain bowel conditions. Cauliflower provides a good amount of folate (B9), a B vitamin that is necessary for a healthy pregnancy. Folate deficiency in pregnant women can lead to problems such as birth defects and low birth weight. In addition to folate, cauliflower is also loaded with other important B vitamins like niacin, riboflavin, pantothenic acid, and thiamine. Cauliflower protects from heart disease in many ways. It contains allicin, which has been found to reduce the occurrence of stroke and heart disease. Additionally, cauliflower can help to lower cholesterol levels in the body. Cauliflower is a great food to include in your diet if you're dieting because it's low in calories and can be used in a variety of ways. Try grating the cauliflower into a "rice" and using it in stir-fries instead of regular rice. You can also boil cauliflower and mash it into a healthier version of mashed potatoes. To get the maximum benefits of cauliflower, Then buy it and keep it in the refrigerator. If you store them properly, then the cauliflower will stay fresh for a week of storage. When you want to boil, boil in a little boiling salt water, do not overcook because then the number of nutrients contained in it will be lost, especially vitamin C.